It is easy to live each day doing the things that you have always done, but to stretch beyond that is where the blessings truly begin. I am an artist as many of you already know! I have peppered my blog and website with all of my paintings & photos because it is in the creativity that I find my joy! Last night, was different in so many ways. I have been painting for over 30 years, but I have only taken 3 art classes. I was challenged last night to do it completely differently…and I fought tooth and nail! I totally resisted…I could not find my flow! It was painful and left me feeling inadequate, because I know how to paint! But then I was challenged by my new teacher “J”. He said to me, “Are you here to learn or do you want to keep doing the same thing?” Well, Hells Bells….dah!!!! I am here to learn I said, “But I don’t know what to do?” AWWWW an admission and a release…I don’t know what to do, can you help me???? It doesn’t seem like much, but that is a step in the right direction. The only thing we all really have to do is ask for help! Through out the evening, I attempted to make the ugliest painting I’ve ever done! LOL Failure, I love it! Not because I failed, but I found that I can do something new and survive! There was an ego hit involved, but that’s cool. I love that I am learning new techniques and a new style of showing more dimension. Learning the contrast between the shadows and light. Mixing different colors with new tools and techniques to create a masterpiece. These are things that I have been asking The Universe to show me for a long time and now it is my time to learn. I started thinking…this is a recipe for life. Later “J” brought in two of his paintings that he has done with this technique and I was taken aback! They were probably some of the most beautiful paintings that I had ever seen. So much depth & detail. They were mesmerizing to me. It was as if I was looking at one of the masters, like a photo come to life! This is what I want to do!!! This is the vision that I see for myself! I made a promise to myself that I will not give up! I don’t quit…I overcome! That is who I am! FYI…most of my successes come from multiple failures. As the night wore on, “J” told me that he could see that I was blocked and he said that I shouldn’t worry that I am good but you have to crawl, before you can walk!!! Again, something that I need to remember! That as a teacher, I must be willing to learn! The Universe is Infinite and so are the lessons! You can see the brilliance and the magic, but unless you try , you will never be able to create the magic and become a Master. It is awesome to have a destination in mind, but you still have to take the journey. I look at it this way, when a baby is trying to learn to walk, they don’t quit the first time they fall. No! They keep trying and trying until they are moving on their feet. Nothing is going to stop them! This is THE MAGIC! They want what they want and there are no thoughts of failure in their heads. No preconceived notions of how it should happen. There is no quitting until they are walking. End of sentence, put a period on it! For them falling down is just a bump in the road. All they care about is walking. So I know, that I went into my art class with some preconceived notions of being the best and found out that I was just crawling. I am grateful that this lesson showed me a new way to the magic! I love opening new doors! I am blessed for the unfolding! Today I realized that I have so much potential! I released my judgments and forgave myself…baby I LET IT GO, so The Universe could give me something better! I am so grateful for my new teacher! I love that I have one!!!! Life is so good and the magic of this place is delicious!!! 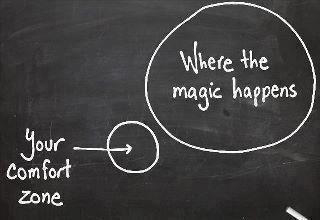 I hope that this can show us all that we all have the potential for creating Magic…whatever that means to you!!! Everything is possible! Remember that the possibilities are INFINITE!